All meetings are held in the society's own Hertitage Centre - the Mission Hall, Grafton Road, Town Yetholm TD5 8RU. 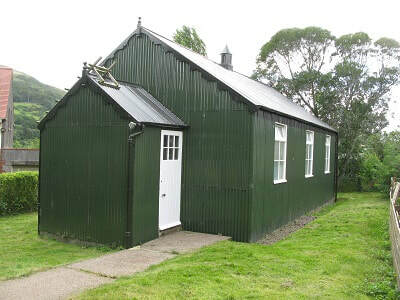 This 'tin tabernacle' (see image below) was built in the 1930s and is itself part of Yetholm's historic environment. It is slightly set back from the road. Syllabus for the 2018/19 session. All meetings 7.30pm in the Mission Hall, unless otherwise stated—All Welcome! Saturday 22 September – Visit to Chillingham Cattle (to be confirmed). Tuesday October 2nd Trevor Cowie – The Bronze Age in the Borders; the View from Yetholm. Tuesday November 6th Margaret Fox – Scotland’s Law Lords and Northumbrians behaving badly – a look at cross-border crime. Tuesday December 4th – Dinner at the Border Hotel. Tuesday February 5th 2019 Isabel Gordon – The Scholar, the Wizard and the Seer – 13th century Borders through the lives of Duns Scotus, Michael Scott and Thomas the Rhymer. Tuesday March 5th David Jones – Dere Street; the archaeology of a Borders Road. Tuesday April 2nd Chris Bowles – The Lost Dark Age Kingdom of Rheged; the discovery of a royal stronghold at Trusty’s Hill, Galloway. Tuesday May 7th – Lindsay Allason-Jones – Women in Roman Britain. Anyone interested in local history might also be interested in talks given at Kelso Heritage Society - a PDF of their current programme can be found HERE.